Have 3 days flown by already? I feel like I'm stuck in this pattern I can't quite make my way out of. That whole unintentional one week at the gym two weeks off thing? Yeah, it's my second week off and though next week should be my 'on' week I'm going to be busy at the boys school with reading week activities. So sick of being stuck in this whole trying to make time for weight loss thing. On the plus side we are back to taking nightly walks as a family after dinner, so at least that is a little exercise there. I broke down yesterday and made an appointment with the weight loss clinic at Miriam to see what they have to say, and what the damage to my wallet might be. They can't even get me in until May. MAY! Feeling stressed that I am again missing boot camp this morning but I just have so damn much to do its crazy. Falling behind and am so in need of a catch up. The boys and I were back at the doctors Tuesday. I thought for sure the Bunny Bee was getting bronchitis and that the Doodle Bop may suddenly be going deaf, since he has scream talked for a week now. The Big Guy still has bronchitis, but we are waiting a week to see if he needs new meds. The Doddle Bop? Passed his hearing test with flying colors and isn't sick at all... to the doctors surprise as well as mine. Just likes scream talking. And the Bunny Bee? 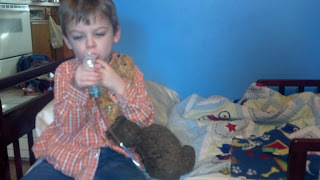 No bronchitis...but we are now treating my poor guy for Asthma. Breathing treatments morning and night for the next week before we make a decision to see if we need to try something else. He is actually posing here. Made me take his photo after he arranged his doggies and refused to look at the camera...he even checked it after to make sure it came out the way he wanted. I'm so scattered this week...trying to keep up with my blog here, the boys, the house, side projects, tying up loose ends at Buy-Her while keeping the posts coming...I feel like I'm forgetting all of the little things. Yesterday I made it to 2 stores and still managed to forget to buy two major items I needed. Oh yeah, and I showed up at physical therapy for the Big Guy only to find I hadn't scheduled further appointments so the slot was taken.